Chumphon Pinnacle Dive Site Diary - One of the best..
Those new to Koh Tao have mostly heard of Chumphon Pinnacle. As a result, those that have dived Chumphon Pinnacle before continue to tell stories about it. Chumphon Pinnacle is often agreed to be the best dive site near Koh Tao. At a distance of about 10km north of Koh Tao, lies the submersed granite boulder pinnacle, casually referred to as “Chumps” by local divers. The rain front from a distant storm was closing in on our mooring position over the south part of Chumphon. During our buddy checks we could feel the rain wall approaching. Just as we jumped off the boat, the cold rain drops cooled us down. However, as soon as we hit the warm tropical water and looked down, Barracuda Rock on the south side of the pinnacle revealed itself in crystal clear visibility. We decided to descend right there and make our way down to the bottom which lies at around 30m deep. First we had to make our way through tons of Fusilier and a few Rainbow Runners. Once we hit our depth we were greeted by a school of One Spot Snapper and Yellowtail Barracuda. This is where our search for the elusive Razorfish began. By carefully scanning the ocean floor with our torches we looked for a vertical glint. Then we found two of them swimming off towards the main pinnacle. Soon they joined their group and there was about 25 of them cruising along the bottom. We watched their weird swim until they eventually disappeared into the silt cloud. The second half of the dive..
Our deco time demanded that we ascend a little. Therefore we turned towards Barracuda rock, where we watched two Marbled Groupers basking in the morning bliss. On our slow profile up the rock wall we began the hunt for macro life. It did not take long to find Ghost Shrimp cleaning a Moray Eel and a few Banded Boxing Shrimp hiding in the cracks. As we turned to look away from the rock, we noticed a school of Pickhandle Barracuda cruising gently towards the main pinnacle. These are large barracuda and always a great sight at Chumphon. We aligned our bodies in their swimming direction and were able to almost become a part of their school. These are my favourite species of Barracuda. The search continued. In a deeper crack we found Banded Pipefish gliding along the bottom and a few Jann’s Pipefish swimming on the ceiling of the crack searching for something to clean. On the final ascent we observed some very large Indica Nudies followed by the swaying of hundreds of Anemone corals. When we looked up before deploying our surface marker, we noticed the sun was out again and the golden yellow colour of the Sairee Cottage Diving boat reflected on the calm ocean surface. On the safety stop we were entertained by Fusilier and Rainbow Runners again. At the end several Reef Squid came and greeted us right on the buoy line. We highly recommend diving Chumphon Pinnacle when in Koh Tao. Sairee Cottage Diving schedules Chumphon twice per week. On Mondays we dive the site twice. 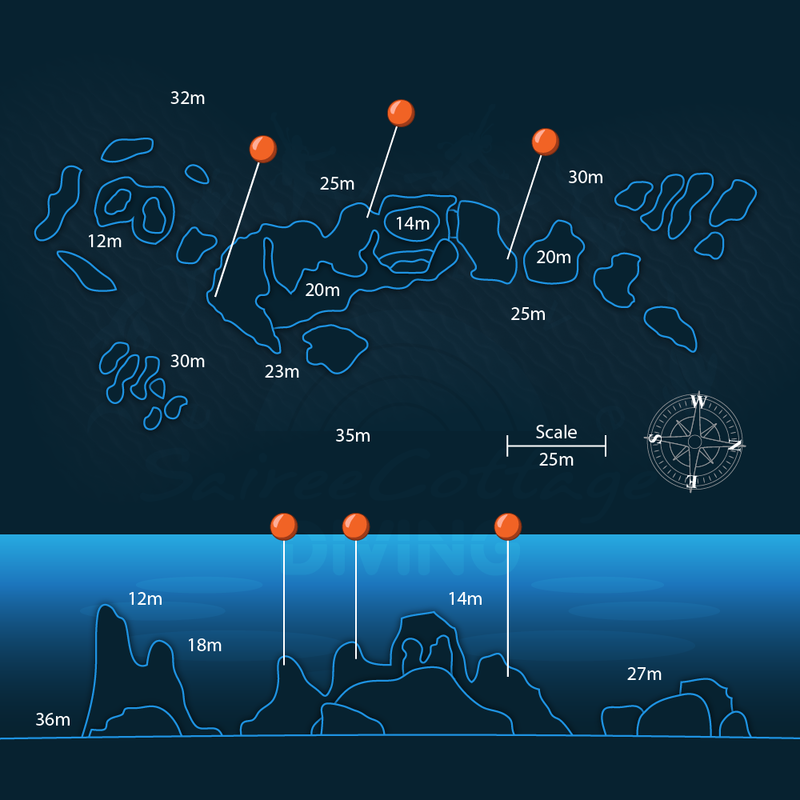 This means we can enjoy the dive site to ourselves and take our time exploring both ends in peace. Generally, April is the best time for Whaleshark sightings and if you can somehow make it, we recommend this time of year for a visit. Have any stories about diving at Chumphon? Share them with us in the comments.